1. Preheat oven to 375 degrees F and adjust oven rack to lower-middle position. 2. To prepare the topping, whisk together the flour, sugars, cinnamon and salt. Add the butter pieces and toss to coat with flour. Using your fingers, pinch the butter pieces together with the flour mixture until the mixture looks crumbly and like wet sand. Add the pecans and toss to distribute evenly. Refrigerate the topping mixture for at least 15 minutes. 3. While the topping mixture chills, get the cherries ready. 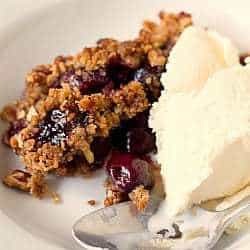 In a small baking dish (about 1.5-qt or 8x8-inch), toss the cherries with the sugar, cornstarch and Amaretto. Sprinkle the topping mixture evenly over the cherries. 4. Bake for 40 minutes, then increase the oven temperature to 400 degrees F and continue to bake until the fruit is bubbling and the topping is deep golden brown, about 5 minutes longer. Serve warm or at room temperature. Note: You can omit the Amaretto if you'd like and just add 1 teaspoon vanilla extract instead.